RCP’s specialised construction programming services provide an integrated project development process which facilitates effective control of the total project enabling optimum project time performance. Owners, developers, financiers, contractors and subcontractors alike entrust RCP to manage their project time risks. Our multidisciplinary specialist programming team employs industry best practice and has expertise across all sectors of the construction industry. Experienced in the delivery of high profile and award-winning projects within Australia and internationally, our programmers fast-track critical path planning skills help to avoid time slippage and cost overruns. Our independent project monitoring and coordination services assist project teams to efficiently coordinate the sequencing and timing for design, documentation and procurement as well as on-site construction and commissioning. We provide construction programming and scheduling services through each of the feasibility, design, pre-contract and construction phases of a project. 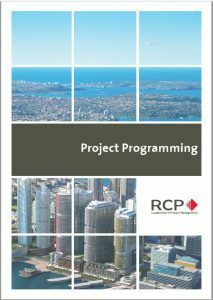 The RCP programming team has diverse expertise across multiple programming/scheduling software packages including Primavera P6, Asta Powerproject and Microsoft Project. We provide both longer term project schedules and short-term implementation programmes in addition to on-going monitoring and liaison for successful schedule implementation and the achievement of overall project time objectives. Provided as an integral component of our project management service, or as a stand-alone service, our specialised programming services help you to measure progress, implement corrective action and reset targets. Whether you require specialist short-term resources or management of the total project, RCP provides a broad range of specialised programming services to suit your requirements.